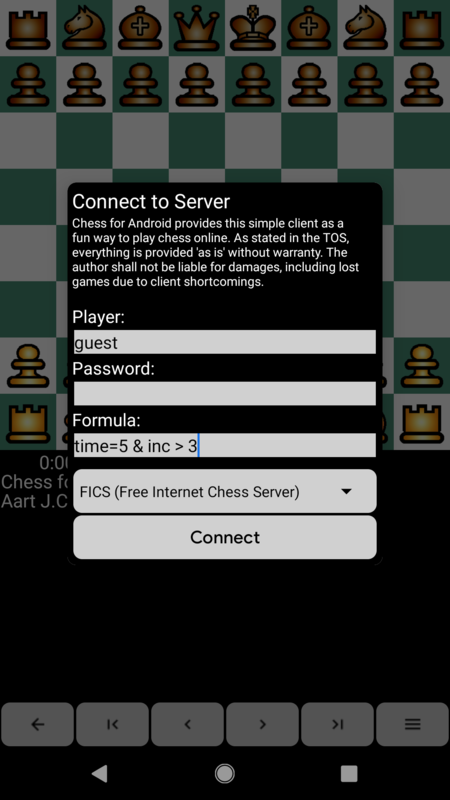 Since v6.0, Chess for Android can be used as an interface to FICS (Free Internet Chess Server), where everyone can play chess over the internet for free. 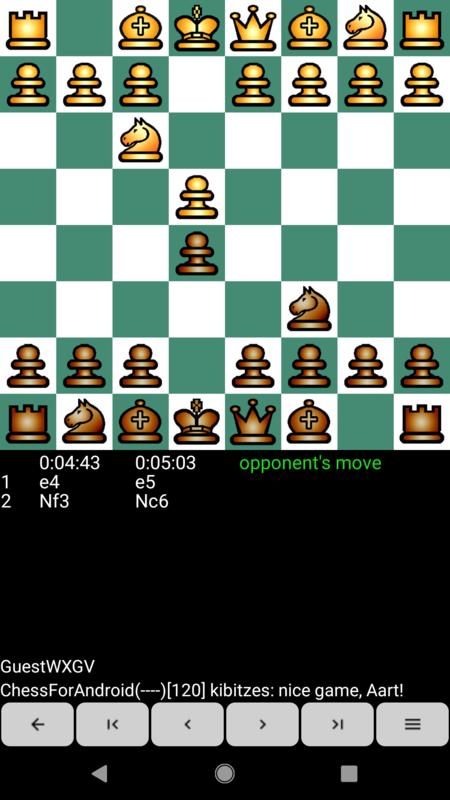 Either play directly on a phone or tablet, or first connect Chess for Android to an external electronic chessboard (DGT, Certabo, and Millennium) to play over an actual chess board with people online. To connect to FICS, long press the notation window in Chess for Android to open the extended menu. Then select "Connect to FICS" and login as a guest or using your register username and password. The formula string can be used to filter out match requests. For example unrated & time >= 5 & inc = 1 only shows unrated games with at least five minutes start time per player and exactly one second increment per move. When playing over an electronic board, it is probably a good idea to pick a color first and add either black=1 (if you want to play white) or white=1 (if you want to play black) to the formula, in order to avoid having to quickly change the board orientation when the game starts. The formula syntax is explained in more detail on the FICS help page. Once connected, your username or temporary guest name is shown at the bottom of the screen. Match requests that pass the filter are shown in a dialog with the player names and game parameters. Either decline, or accept and the game starts at once. During the game, both players' names are shown at the bottom of the screen (white always at the bottom) and the board is automatically oriented with the side you are playing down. The status message shows whether it is your turn or the opponent's turn. Chat messages, if any, are shown next to the player's name. Click one king and then the other king to open a dialog to offer a draw or resign. If the opponent offers a draw, use the same mechanism (in that case offering really means accepting). When the game ends, a termination message appears at the bottom of the screen. The game can be saved to SD card or shared with another program as usual. If, at any point, the GUI is out-of-sync with FICS, the game continues from the most recently sent FEN position. Even though this drops full game history, at least this attempts to avoid dropping the game altogether. 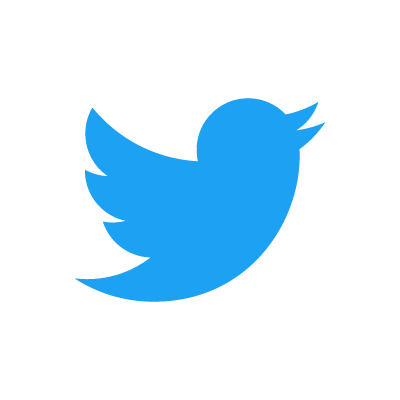 Also, if you suspect a message from FICS was lost, pressing the forward button › requests a refresh from FICS to verify the GUI is at the most recent position. Per FICS policies, all chess engine features are disabled while connected to FICS. 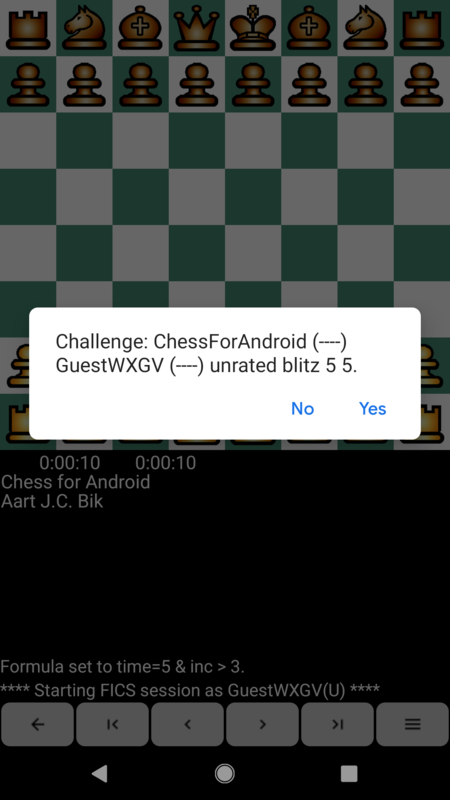 To analyze a game with a chess engine, first disconnect from FICS.